I have always been a fan of one-pan dinners…they just make my time in the kitchen so much easier. One night, I had some mushrooms that needed to be used ASAP, so I threw together this Creamy Mushroom Garlic Chicken Recipe that you guys are going to love! It’s not often that I make creamy skillet meals because they can tend to be pretty caloric. But now with the changes in the new Weight Watchers Freestyle program, I’m able to splurge my Points a bit on the good stuff. And by good stuff, I mean creamy sauces that are so velvety and decadent that it feels like I’m indulging at my favorite restaurant. I know that some people have very strong opinions about mushrooms – they either love them or hate them. But I’m on Team Mushroom Love, so this dish has become a fast favorite of mine. 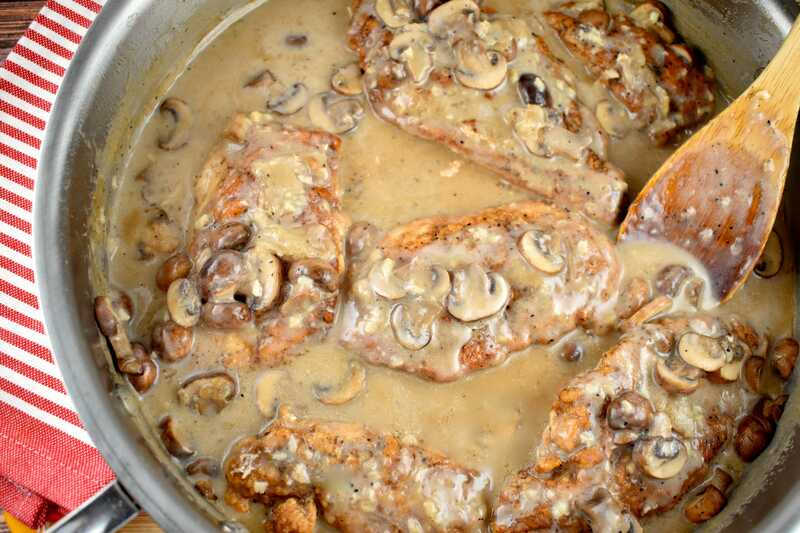 Tender, juicy chicken smothered in a creamy, garlic mushroom sauce, all in just 30 minutes. What’s not to love?! You can eat it as is, or serve over pasta or rice. But since I’m watching my Points, I’ll often just serve this with some steamed or roasted vegetables. I let that heavenly mushroom garlic sauce ooze over my veggies, and it is divine! At just 6 Points per serving, this is one incredible 30-minute meal that your whole family will love, just as much as mine did. A quick, easy, one-pan dinner recipe that delivers tender chicken smothered with a velvety mushroom sauce. Split chicken breasts, lengthwise, into 4 fillets. Season both sides with salt and pepper. Add flour and onion powder to a shallow bowl. Dredge each chicken fillet in the flour. Heat a large skillet over medium heat. Add butter and oil to a pan. When the butter has melted, add the chicken fillets. Cook until golden brown, about 4-5 minutes on each side. Transfer chicken to a plate and set aside. Add garlic and mushrooms to pan, and saute until tender. Stir in chicken stock and let it come to a simmer. Scrape the pan to remove all the browned bits from the bottom of the pan. Turn off heat, then add in heavy cream and mix. Transfer the chicken back into the pan, and heat on medium heat for another 2 minutes, until the dish is hot. Spoon mushroom sauce over each piece before serving. Good Gosh Golly………I soooo LOVE your recipes!! What a gift that you share them with us all!! THANK YOU. THANK YOU. THANK YOU!!!!! All the ones I’ve tried have been truly wonderful and most certainly PINNED !!! Of course, I always sub out “creams” with 2% milk or lite sour cream/cream cheese, but they are all still so fab!! What a Blessing!!! Mushrooms are the 2nd ingredient listed. The recipe looks delicious, but there is no mention of mushrooms in the ingredient list.